Tinware, one of the most classically American metals, is the material of choice for many products from one of our favorite brands, Jacob Bromwell. Tin was first made popular by its ease, both of cleaning and of maintenance. Its origin as a household item was in Colonial America around Connecticut, though it also happily resides as an element on the periodic table. Tinware was discovered as useful for its hardening effects on copper and general ease in bonding. It is also synonymous with the Industrial Revolution, as many inventions were crafted out of this metal, and it also became a means of bartering. 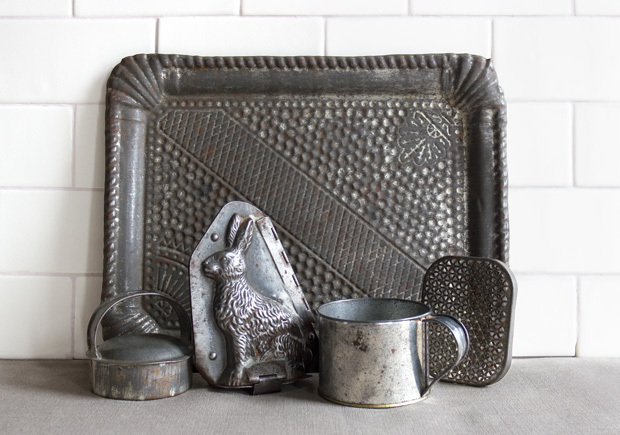 With a history as rich as this, we are proud to have tin in our inventory. Materials like aluminum and plastic have gradually become favored, but we still prefer the original. Tin has many pros over other more modern materials, such as its high level of recyclability and its tamper-resistance. We’ll raise our (tin) cup to that!